BOSTON (August 28, 2018) – Consumers have seen the most expensive summer at the pump since 2014 with an average of $2.73 per gallon thus far, according to GasBuddy, the only smartphone app connecting drivers with their Perfect Pit Stop. 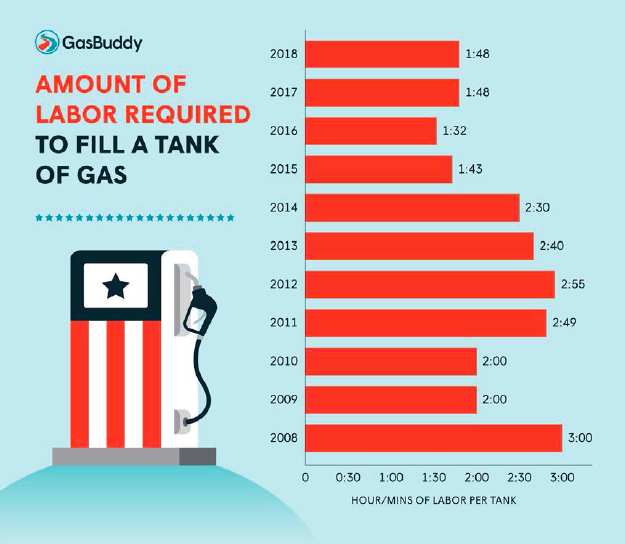 The average gas price over Labor Day weekend is expected to be $2.84 per gallon, a 20 cent increase from Labor Day 2017.
work 3 hours to fill their tanks. total fuel bill, while the highest since 2015, will still be the third lowest since 2011.
later in the summer due to Hurricane Katrina.